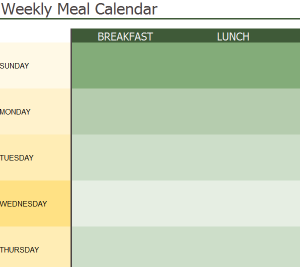 The Weekly Meal Calendar is a simple and straightforward way to plan out your meals. Whether you are trying to eat healthy foods or just want to remember the meals you bought ingredients for, the Meal Calendar has everything needed to organize your meals for the next week. This is the perfect tool to go shopping and only buy the essentials. No more needless spending on groceries. Save money and your waistline with this simple template. The first step is to download the completely free file located at the bottom of this page. Simply click on the link provided to get started! Once you have the document open you can start entering your meals for the week for breakfast, lunch, dinner, and even snacks! The column to the far right highlighted in yellow represents each day of the week. When you want to plan a meal for a certain day just click inside the cell under one of the meals of the day and next to the day of the week you want. You can add the name or description of your meal by clicking on any cell and typing in the information you want. When you have all your meals planned out for the entire week you can print the document to view whenever you need. Just click the “File” tab in the upper-left corner of the screen and select “Print” from the drop-down menu that appears. By planning out your meals before you go to the grocery store you’ll have a detailed list to buy only the essentials. This way you will save money on unnecessary expenditures for all of your shopping trips. This will also get you in the mindset to start eating healthier instead of buying fast food every day. Get the most out of your grocery runs by downloading this calendar today!